Nic Clarke is an historian at the Canadian War Museum who has researched Canadian Expeditionary Force policy concerning the physical fitness of recruits, and the implications of rejection for volunteers. 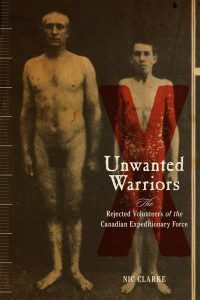 The following is an excerpt from his recent book on the topic, Unwanted Warriors: The Rejected Volunteers of the Canadian Expeditionary Force (Vancouver: UBC Press, 2015). We publish it with the author’s blessing and the permission of the University of British Columbia Press. At the outset of the war in the summer of 1914, Canadian military authorities had, on paper at least, a black-and-white model of military fitness. An individual was either fit or unfit to serve. There was no middle ground. Moreover, the physical standards an individual had to meet to be deemed fit to serve were exceptionally high. By the end of the war, however, the military authorities’ definition of military fitness had changed radically. This transformation took the form of both a lowering of the minimum physical standards for service in many units and a wider reconceptualization of what it meant to be fit for military service. The changes in minimum height and visual acuity criteria are but two of many examples of how standards for service were lowered between 1914 and 1918. At the start of the war, recruits were required to be at least 5 feet, 3 inches tall. By the end of the war, this had been lowered to 5 feet for infantrymen, and some support units could accept men standing 4 feet, 11 inches. Visual acuity standards also became less stringent as the war progressed. Whereas recruits were expected to have perfect vision in 1914, this was certainly no longer the case by the time Canadian troops stormed Vimy Ridge in April 1917. Furthermore, by the end of the conflict recruits were permitted to use glasses to meet the Canadian Expeditionary Force’s new, lower standards, an allowance that only officers could avail of at the start of the war. The lowering of physical standards for combat infantry was accompanied by a change in the way Canadian military authorities conceptualized military fitness more generally. By 1918, they had shifted from the dichotomous system (fit/unfit) it used to categorize recruits in 1914 to a complex taxonomy of military fitness that recognized multiple levels of ability. This metamorphosis came about in part because of the realization that even if a recruit might not possess the physical attributes of a successful combat soldier, he could still play an important role in uniform. For example, he could usefully fill one of many mid- and rear-echelon positions that the Canadian Expeditionary Force required in order to operate effectively. An increasingly complex organization, the force needed men for typing and carrying out other administrative and logistical tasks as much as it needed them for operating machine guns and launching trench raids. Men with physiques deemed unsuitable for combat were progressively employed in these positions as the war continued. In its waning years, recruiting staff were instructed to direct potential recruits found unfit for combat to apply for positions in support units. Importantly, employing such men in these positions would enable those soldiers deemed to have the physical attributes necessary for combat to be placed at the frontlines rather than behind a desk at the rear. Thus, by 1917 the military authorities had begun carefully combing through the rear echelons looking for men fit for the trenches whom they could replace with those who met a lower standard of military fitness. Such seemingly judicious use of manpower resources had its critics, however. A number of officers in command of support units complained when one or more of their men were reassigned to combat units and replaced by men deemed unfit for combat. Headquarters also received complaints from officers when they lost men who had been accepted but later judged unfit for military service. In both instances, the officers’ complaints were founded on concerns that they were losing men who, because they had important skills that were rare in the general population, could not be easily replaced. For these officers at least, definitions of military fitness came second to the important skills an individual brought to the table. Such complaints highlight the fact that the multiple categories of military fitness developed during the war could hinder as much as support the efficient use of manpower resources. The military authorities did recognize useful skill sets, and on occasion made allowances for men based on their specialist skills and experience, but the set categories of military fitness remained the benchmarks by which men were defined and their roles in the war effort were determined. …The minimum physical requirements for some specialist units increased as the war continued. For example, after a brief dip, the minimum height requirement for heavy artillery gunners rose; likewise, the physical standards for a Royal Flying Corps pilot were far above those for an infantryman and did not shift as the war continued. In addition, we should be careful not to attribute an overly negative connotation to the word “lowered” when discussing the changes to the Canadian Expeditionary Force’s minimum physical standards. Although these standards were lowered in the sense that less was required of some recruits, the changes implemented did not impact negatively on the ability of individual recruits to successfully carry out their mission or that of the force as a whole. The victories at Vimy Ridge and Passchendaele and during the Hundred Days were achieved with many men who would have been rejected as unfit to serve in 1914.